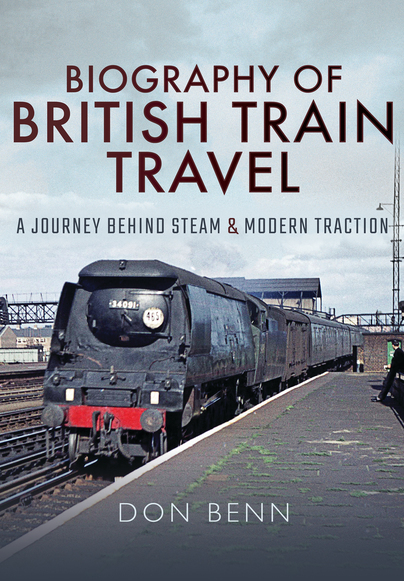 You'll be £30.00 closer to your next £10.00 credit when you purchase Biography of British Train Travel. What's this? Biography of British Train Travel is a collection of mainly previously unpublished articles and short stories, covering a lifelong interest in railways. It spans a wide spectrum over the years, from the early days in Kent in 1960, through the many hours on the lineside on the Surrey Hills line and the South Western main line, to the last frantic years of steam on the Southern, and the current steam scene, as well as the privileged and exciting times spent riding on the footplate of steam locomotives. It majors on the author’s main railway passions of steam locomotives, train running performance, including modern motive power and all matters Southern. Locomotive performance in Europe and a tramway are also included, as is a fascinating minor- and little-visited narrow gauge railway in southern England, plus heritage traction on the London Underground. The book comprises approximately 350 illustrations, many in colour, as well as contemporary timetable extracts and copies of notebook pages, which cover shed visits in Scotland. Fifty train running logs are included, together with some detailed records of days spent by the linesides of railways when steam was still the predominant motive power in parts of the south. A book that is diverse and curious and interesting for those who are on the rails. Beautifully illustrated book chronicling Britain's railway heritage. No one can fail to be moved by the contents of this book, it really is superb. Don Benn, the author of this book, was born about half a generation earlier than me, so he got to see the transition from steam to electric that I JUST missed. However, the area he covers is where I grew up riding on the Southern Railway, and so I was delighted to see the wonderful pictures, and to read his reminiscences about railways in Kent, Sussex, and Surrey just before I experienced them. The personal nature of the stories brings an immediacy to the material presented, and complements the excellent selection of photographs and other snippets such as timetable extracts notebook extracts. While reading this book, my memories of being a youngster on the trackside and on the trains was rekindled very evocatively. I highly recommend this book as a great repository of personal reminiscences combined with a wonderful set of photographs capturing the spirit of Southern Railways.